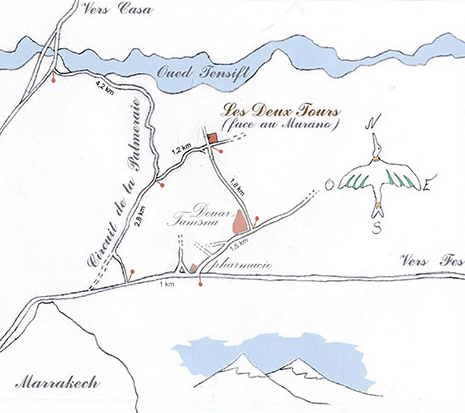 Les Deux Tours Location. 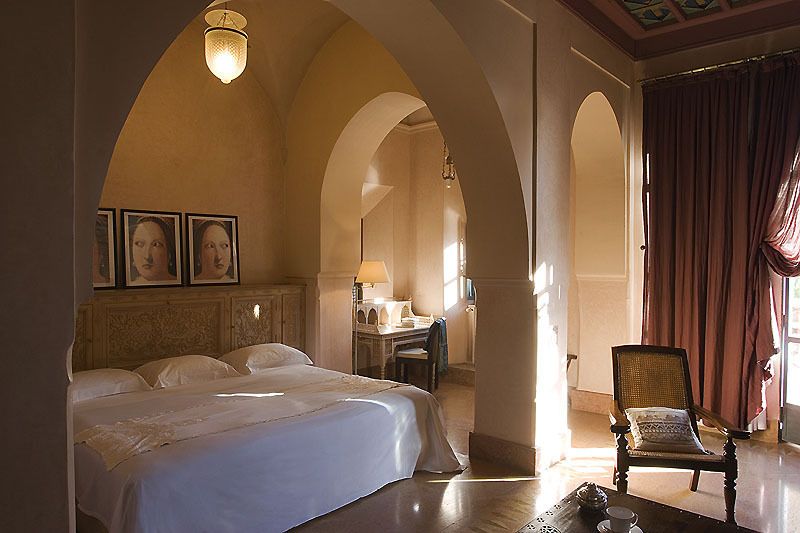 Book Les Deux Tours Today with Hip Morocco - Holiday Accommodation in Marrakech, Morocco. 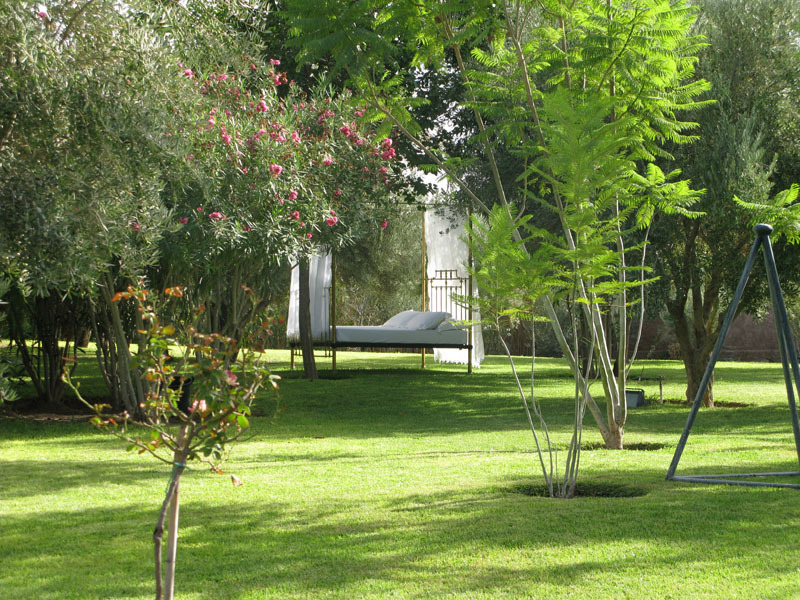 "a fantastic place to experience total relaxation"
Les Deux Tours is a stylish boutique hotel situated in the Palmeraie; about 20 minutes drive from the centre of Marrakech. 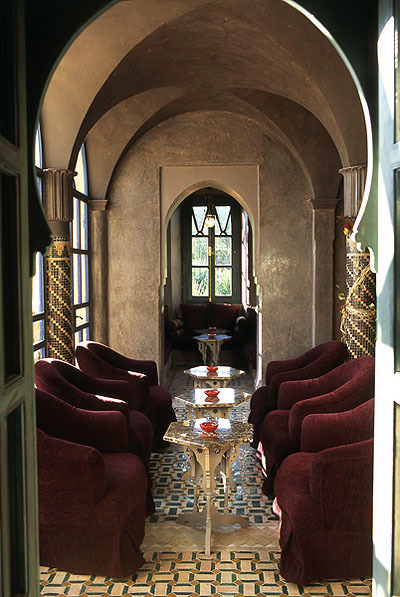 Built over 30 years ago, this beautiful hotel was designed with an organic, natural and welcoming ambiance by one of the most influential architects in Morocco, Charles Boccara. Water trickles around the grounds along small canals, through the sumptuous gardens and into hidden pools. The gardens themselves are mature with palms, orange trees, bougainvillea and scented flowers at every corner. Here you can find many secluded spots; there are even four-poster beds scattered around the gardens for you to enjoy the relaxing ambience of this beautiful space. 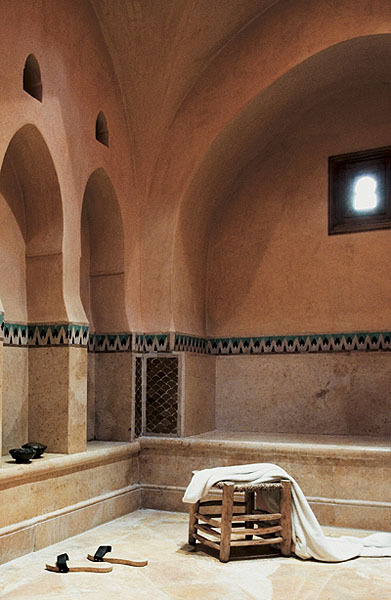 Les Deux Tours is home to one of the best Spas in the region, which offers a traditional Hammam experience alongside other treatments. The hotel also houses two bars, one with an open terrace overlooking the gardens, and two restaurants, including a Michelin-starred chef. 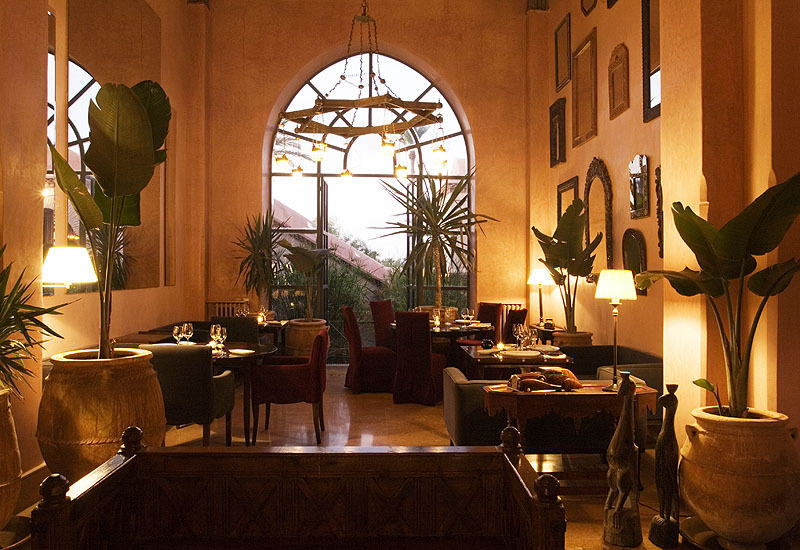 Indeed, from top to bottom, Les Deux Tours is the perfect place to relax and indulge oneself in all the sumptuous delights Morocco has to offer. The hotel has 36 rooms, comprising 12 Classic Rooms, 12 Junior Suites, 7 Premium Suites, and 5 Pool Suites. 100% natural Nectarome bath products. The hotel also houses two bars, one with an open terrace overlooking the gardens, and two restaurants, including a Michelin-starred chef. 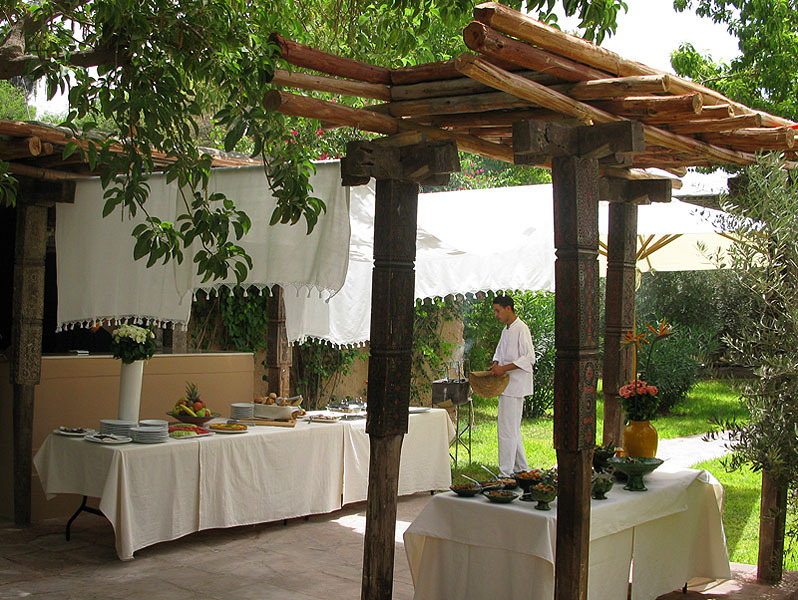 La Pergola welcomes you to discover its seasonal cuisine year-round. The chef carefully chooses all of his ingredients including vegetables and herbs grown in our kitchen garden. Come and enjoy an exceptional moment at our gastronomic restaurant. Le Salammbo promises you a pleasurable experience, to savour on our terrace or in the magnificent decor of the dining room. This backdrop enhances the value of the intelligent and beautiful simplicity of the foods prepared by the chef. He renews the menu according to the season and his inspiration. 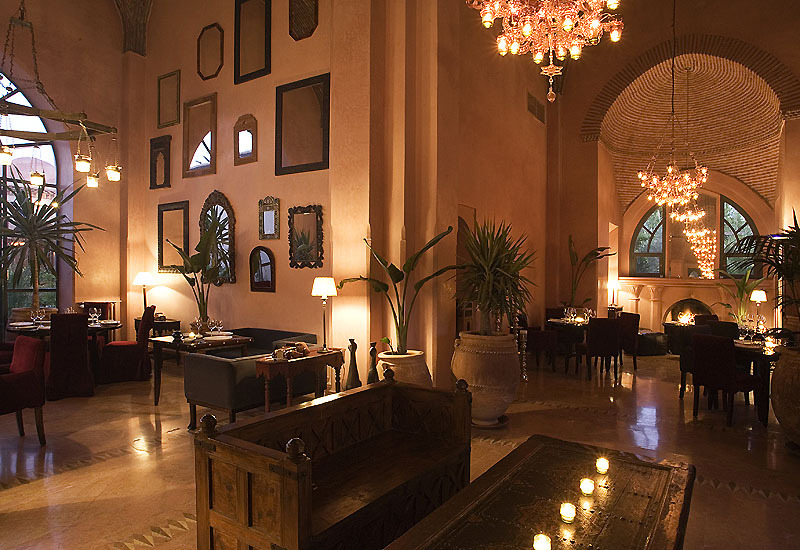 The cuisine includes the great classics of the Moroccan kitchen such as briouates, pastillas, tajines and couscous. French gastronomy is also on show here with a seductive range of dishes. The Mediterranean sun shines through revealing its richness in the different culinary preparations. Seasonal and top quality products, selected for flavour and freshness, guide the chef in making his selections for the a la carte and daily menus. The chef takes an imaginary voyage here and there around the Mediterranean as he expresses himself in his cuisine. Fresh vegetables and herbs from our kitchen garden reveal their flavours in each of his dishes. And of course wine from Morocco and France accompany this fine cuisine. Don't hesitate to ask our advice on the best wine/cuisine pairings. "This hotel is beautiful, immaculately clean and the gardens incredibly well maintained. Although I've just made it sound like a typical five-star hotel, Les Deux Tours successfully avoids the curious sterility of most five-star establishments by having an individual personality." "Amazing hotel and an oasis of tranquillity and calm. The gardens are well maintained and beautifully set out with lush trees, bamboo and several ponds and a larger than average swimming pool that you could actually do lengths in. At night the grounds are lit by Moroccan lamps and candles around the ponds, which is so pretty and romantic. We had a junior suite which has a lovely courtyard area with an open air shower, which was amusing in the least. There was also an adjoining sitting room with comfy chairs and fireplace for the cooler winter months and a large bathroom (with indoor shower) and also a separate bedroom. The spa is also a haven of peace and relaxation, I has a "top to toe" treatment which consisted of a hammam, massage, facial and manicure and pedicure. Once I got past the tiny paper knickers I thoroughly enjoyed the whole experience and came out felling relaxed and totally pampered!!" "Over the last few years I've stayed in a handful of countryside spas and upper range hotels but Les Deux Tours outdoes them all in essentially all respects. Les Deux Tours is an unmissable experience and I recommend wholeheartedly to anyone." "A fabulously designed hotel and gardens. I guess quite a few people can stay here but you'd never know, all sorts of nooks and crannies with private courtyards all beautifully positioned. And then the nice touches, the double four poster beds the appear in the gardens to lounge on, the long and enclosed views from the terrace which are just fab. I loved this place!" 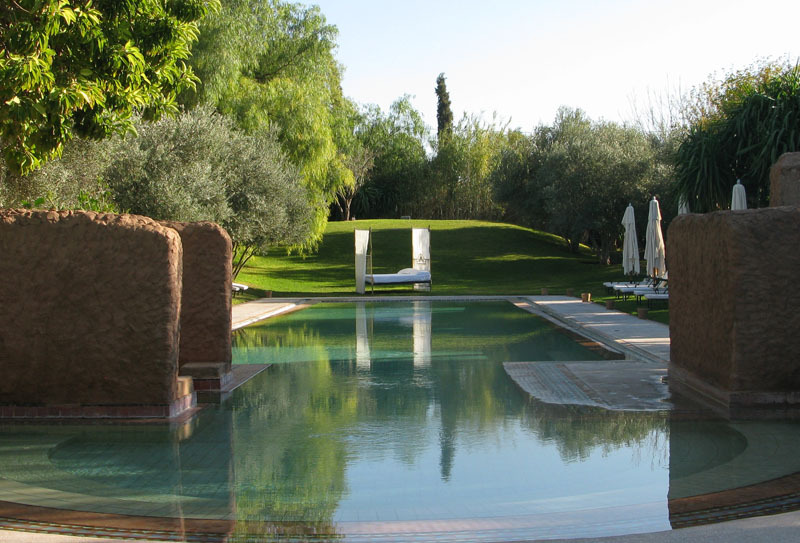 Les Deux Tours is a stylish boutique hotel situated in the Palmeraie; about 20 minutes drive from the centre of Marrakech. 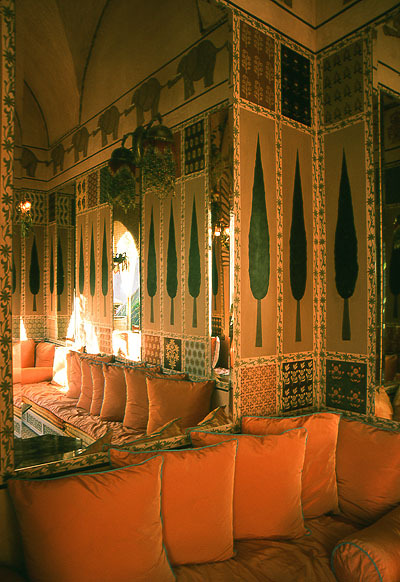 Opening onto exuberant gardens or patios, the 12 Classic Rooms exude an atmosphere of beauty. Old meets new as elegant contemporary decor combine with element of traditional design in a harmonious marriage. 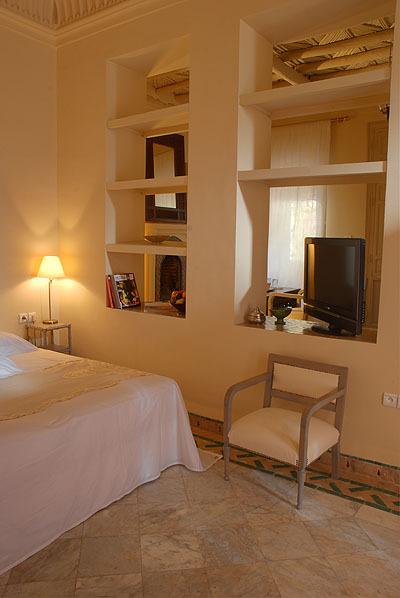 The rooms may be arranged with double or twin beds depending upon your needs. Room features: Central heating, air-conditioning, mini-bar, personal safe, cable and satellite TV, direct telephone line and en-suite bathroom. The 12 spacious Junior Suites overlooking the garden each feature a large bedroom that can be arranged as a double or twin, a comfortable sitting room and an en-suite bathroom. This intimate setting provides a cosy retreat for all guests: expect soft tinted curtains, traditionally tiled floors, rare marble, and delightful arcades and domes. 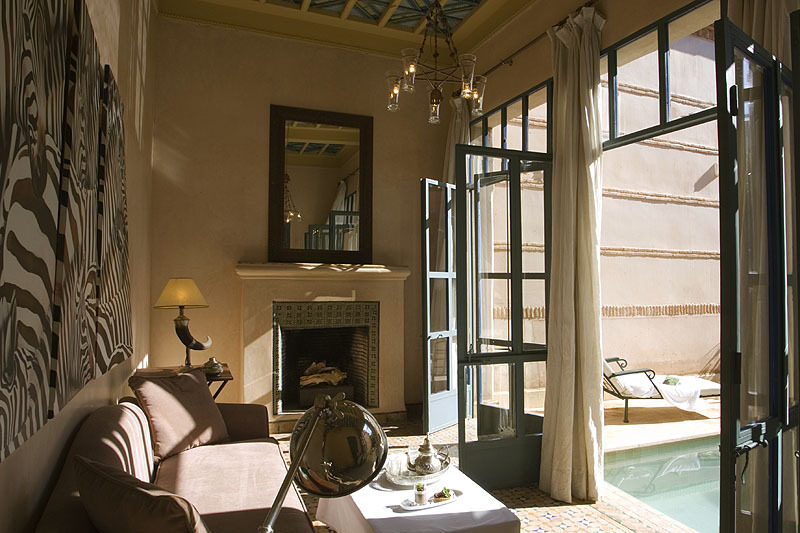 Modelled on the architecture of a Moroccan riad, the 5 Pool Suites each offer a large and luxurious space, a total of 125m2. 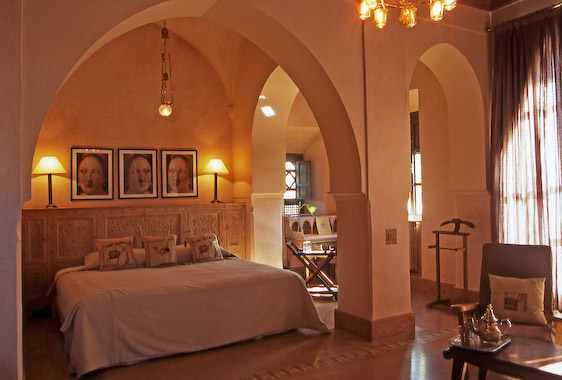 These suites are inspired by the refinement of the traditional grand mansions of Morocco, and come equipped with a private unheated pool, gardens and private salons. The suites are complete with king-size bed, fireplace, central heating, air-conditioning, mini-bar, safe, plasma screen cable/satellite TV, and direct dial telephone. Room features: king-size bed, fireplace, central heating, air-conditioning, mini-bar, safe, plasma screen cable/satellite TV, and direct dial telephone. The 7 spacious Premium Suites at Les Deux Tours feature a living room, a spacious bedroom and a luxurious bathroom. 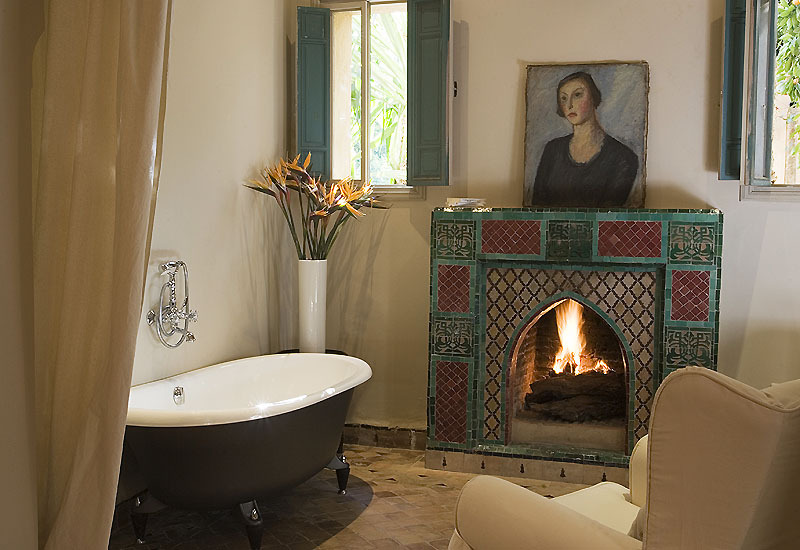 Each suite is decorated to a high standard in a contemporary Moroccan style and offers glorious garden views. The suites come complete with central heating, air-conditioning, mini-bar, safe, plasma screen cable/satellite TV, and direct dial telephone. The lounge can be changed into an additional bedroom if desired. Room features: Central heating, , mini-bar, safe, plasma screen cable/satellite TV, and direct dial telephone. The lounge can be changed into an additional bedroom if desired. The base rate price at Les Deux Tours is in pounds, euros, or Moroccan dirhams and exchange rates are approximate.